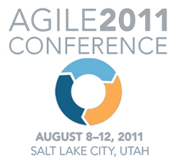 It was great enthusiasm that I set off to Salt Lake City last month for Agile 2011. In the lead up I was a reviewer on two stages (Testing & Quality Assurance and Working with Customers), plus I was lucky enough (and apparently the only submitter) to have all three of my original submissions accepted (although conference rules, for good reason, restrict speakers to two sessions). Whilst its a been a month since the conference (I took some time afterwards to spend time on both the east and west coast of the USA), I wanted to ensure that I posted my notes. Here are the notes from the sessions that I attended on day one. Mary Gorman and Ellen Gottesdiener led this tutorial. They started by taking about requirements by collaboration and leading a discussion on things that hinder and help. The example for this tutorial was getting to the Agile 2011 conference. We first ask the question: what do we value. We then need to look at the business rules and prioritise them. It is recommend that you come to these workshops with some pre-planning but be under the agreement that they are draft and often wrong. These could be release or iteration planning workshops. You can do this at the big view (business process, features, MMF, scenarios), pre-view (user stories, user story maps where you lay out stories left to right, scenarios) or the now view (buildable, scenarios). The granularity will change. Need to have a structured conversation to communicate effectively. Face to face is the most effective and get a shared understanding of the highest value. Overall, this was an enjoyable session. I really liked the templates for mapping out the requirements (despite the fact that these were essentially just aids for the workshop) as they helped focus the conversation and gave our group something to focus on. Mary and Ellen are currently writing a book based around this content, so I look forward to seeing that in the future. Christopher Avery (creator of the Leadership Gift and author of The Early Admissions Game: Joining the Elite, which apparently is 10 years old and still in print) led this extremely packed session, the essence is contained in this publication available here (as well as here). We started the workshop by competing in a spaghetti challenge (based on the Marshmallow Challenge) which consisted of the materials of just 10 pieces of spaghetti and a line of tape. The team I was working with constructed a tower of 35 inches, which ended up being the second tallest in the room. We then did a “Be With” exercise, which was essentially sitting knee to knee with the person next to you, in complete silence, for 30 seconds, to feel the others anxiety. Ultimately, it’s not the other person that makes you feel bad, it is yourself. Confront is the angst of confronting yourself. If you want to change something you need to poke it, and observe the change. what if you had to reproduce the code, if you had the same team and resources? what percentage would be more efficient the second time? modal is 70%. You would be better because you have solved the problem before. Learning takes time. Essence of agility is to learn and take feedback. There is lots of feedback in agile practices such as retrospectives, showcases, standups, etc… If you are not going to do anything about it, stop investing in the feedback loop. The fastest way to learn is to take ownership. Fastest way to elevate responsibility in a group is demonstrate it yourself. 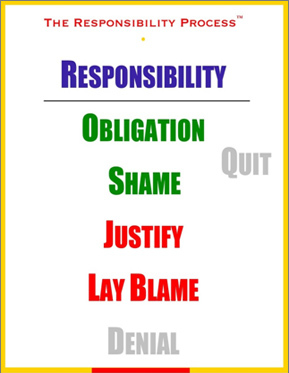 If you are saying people around you are not displaying responsibility, then you are just laying blame. Taking responsibility is owning your power and ability to create, choose and attract. Responsibility is the design space. What do we want from this? Be clear with what you want and be clear about the consequences. Responsibility gives you power but also potential consequences. There is a difference between choosing something and avoiding something. As a coach you get to intervene in situations, so you need to act from a position of responsibility and check where you are coming from (move through the model as quick as you can). Ask yourself if your message is clear and does not sound like blame. If you must give advice, give three alternatives so they have to choose, putting responsibility on them. “If I were in your shoes I might consider a…, b…, c… What do you think about those?” One coaching company advises 10 alternatives, so you really think about the responsibility. There are a bunch of resources at Christopher’s website, in particular he encouraged us to get a copy of the teaching poster and empowered us to teach the process to our peers. Overall, I really enjoyed this session, as I had heard good reports from this session when it was help in 2009, and this year it was listed as one of the most popular sessions. The responsibility process is something I would really like to work on personally. This was one of the highlights of the conference where 15 of the 17 original authors of the Agile Manifesto got together on a big park bench to discuss the writing of the manifesto. Jim Highsmith noted that there us nothing about it that he would change and would not get back together with these people to do it! Jim Highsmith commented when asked about the next 10 years that agilists don’t predict! Brian Marick recalled that the stated objective of the meeting was a manifesto and it seemed miraculous that they left with a good framework . Bob Martin was just surprised that he has been to one meeting that worked! Agile Manifesto nailed it as a baseline – they might have added “we really mean it” or “we are not kidding”! other potential names for agile were: adaptive, hummingbird, lean (used already), PPP, a bunch of acronyms, did not want a word they would have to wear pink tights and a tutu to explain! in software, we still need to ask how do we do a better job? A reunion site has been setup in conjunction with this event. Finally, I recorded a short audio podcast for The Agile Revolution wrapping up Day 1 of the conference.